To say this is shaping up to be an extremely exciting season of volleyball could be considered something of an understatement. Really not sure if this first tournament’s display should be considered the benchmark by which we gauge the boys, but it certainly gives us a starting point. To be fair, this was their first true contest and while no medals came home at the end of the day for our guys, there were certainly many positive lessons to be taken away from the day’s competition. 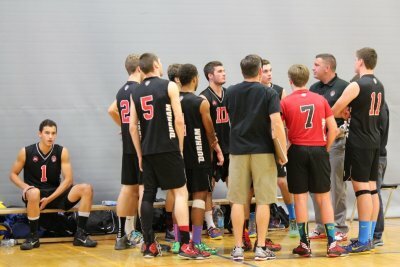 Durham Attack 18U boys were ranked 8th coming into this tournament, so the fellas knew it was going to be a tough, challenging contest. The pool play was proof of this, as they found themselves up against the 2nd place Niagara Rapids, and the Aurora Storm, ranked 6th in the province. As has been the case for a couple of seasons at least, the boys still struggled with getting their heads into the game early. But after a slightly less than stellar start in the first set, the DA squad challenged the Rapids throughout the 2nd set and pulled off an extremely hard contested 29-27 win, forcing a tiebreaker. Sadly, after another series of exciting rally’s and hard hitting back and forth action, Durham came up a little short in the 3rd set, 13-15. The match against Storm was more of what we expect to see on a regular basis going further into this season. DA had a noticeably upbeat start and with solid blocking, strong serving and hitting, took an early lead and held on to take the first set 25-23. The second set saw a continuation of the positive spirit and dominating play, resulting in a slightly easier 25-14 win. Now that they were starting to enjoy themselves and relax a little, DA’s play the next game vs. the very challenging Pakmen 17u, was again upbeat and positive, even when they found themselves struggling in the second half of the first set. Dropping that set 20-25 would have been a mental obstacle hard to overcome in the past, but a newly developing maturity and determination helped the boys dig deep, play with a renewed intensity and pull off a 2nd set 28-26 victory. The tiebreaker was a mere formality as Durham controlled from the start and took the set 15-6. This win brought DA into a match with the number one ranked Pakmen 18u. As expected, the competition wasn’t getting any easier. Similar to their previous match, the boys were in this one, matching Pakmen point for point in a very exciting seesaw battle, with plenty of fast paced action and excellent defence on both sides of the net. Alas, Pakmen managed to string together the last couple of points to squeak out the 23-25 win. The 2nd set was another close battle until Durham’s defence inexplicably collapsed and they found themselves on the losing end of a 13-25 score. Still, this put them into the bronze medal match, where they finished the day as they started, playing the Niagara Rapids. Two extremely close sets ensued, with plenty of focus and emotionally driven action keeping it close. On this day, the Rapids prevailed, taking the Bronze in two straight sets, 25-27 & 23-25. All in all, when you consider the hard won battles, lessons to build on, and DA’s four position climb to finish the day provincially ranked 4th, not a bad first outing. A New World in 16U Premier division for 15U Girls Mighty Ninjas!